Where should your company do each part of its computing — in the cloud or on the ground? Which type of cloud should you use — private, public or hybrid? Who should you trust to manage your cloud computing? Our team can help answer all of these cloud questions (and the ones you haven’t thought of) because we’ve been part of the cloud revolution since the beginning. From your end, it just works. As your team performs its responsibilities, they aren’t aware that one process is happening in the cloud and another is happening on your servers. Your entire network operates as smoothly and securely as if it were running on completely dedicated infrastructure. A cloud computing innovator since our inception in 1998. Back then, no one called it the cloud. Utility computing and hosting were the terms of the day. 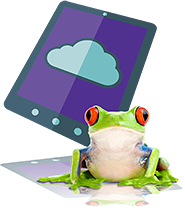 To date, Leapfrog has designed and implemented hundreds of integrated cloud solutions built on either our private cloud, our clients’ private clouds or in the public cloud. We currently manage thousands of devices that operate using our cloud solutions — it’s part of our unified, streamlined approach to managed IT services.